Kenlake State Resort Park will have Breakfast with Santa on Saturday, December 15th from 8 to noon! Bring the family out for breakfast and let the kiddos meet and get a photo with the big man in red. 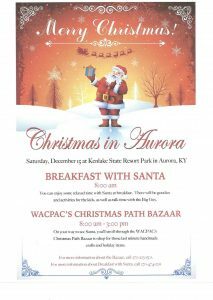 This year we have also teamed up with the WACPAC at the Aurora Community Park to offer a Christmas Bazaar. We will have local artisans and crafters set up all over the hotel for any of those last minute gifts and stocking stuffers. We have 35 different vendors. Shop Local this season! Craft Bazaar will run until 4 PM. For more information Call Bonnie at 270-205-1501 We also have a FaceBook page at Aurora Community Park or call Kenlake Resort Park at 270-474-2211.